If you’ve bought a used bit from the consignment corner at your tack shop or you’ve taken your bridle apart to clean it, you’ll want to clean your bit. Before you start always take the bit off of the bridle, as you don’t want the leather to get wet if you need to soak the bit. There’s no need to use harsh cleaners; you probably won’t want to use a cleaner not specifically made for bits since there’s a chance it will be difficult to rinse off and end up in your horse’s mouth. Bits made of different materials like sweet iron or rubber might hold the scent or flavor of the cleaner or a cleaner may actually harm the seasoning of the metal. Scrubbing with plain hot water and an old nail or toothbrush usually gets most of the grime off. Vinegar is used to clean many things. If you need a little more power, add a splash of white vinegar in the wash water. Soak the bit if there is a lot of really gummed on grime. Scrub the bit, being sure to get inside any joints. Rinse well. If you use a commercial cleaner, follow the instructions and rinse the bit thoroughly. If the copper on a bit looks dull, it should shine up well with vinegar. You can add salt to the vinegar for more cleaning power, but this again might leave a nasty taste. Soak the bit and leave it in a vinegar and salt brine. When it has brightened up, be sure to rinse well. To polish bits, you can buy special polish paste. Be sure to use polish only on the rings and shanks and not on the mouthpiece. If you have a nickel plated bit that has rusted, it isn’t possible to remove the rust. In fact, if you to try to buff it away, you might actually remove more of the plating. If the bit is badly rusted, it may be time to replace it. To dry the bit, use a soft cloth like cotton terry or flannelette. Leaving the bit to air dry will leave spots—which may not be a big deal if you’re just schooling or trail riding. If you are showing, attention to detail can count. Put the bit back on your newly cleaned bridle, or hang it up in a dry place. You may have read that you can polish stainless steel with flour. If you try it, you probably won’t see any significant shine. Baking powder on a damp cloth does help bring up the shine a little and removes any residual grime. Again, rinse well. Flour or baking soda won’t hurt your horse, but baking soda won’t taste good. If you have a sweet iron bit, don’t try to remove the ‘rust’. This is the seasoning that is felt to make the horse salivate. Just wash it and scrub off the grime. You can polish the rings or shanks on a sweet iron bit. Show bits with silver need a little extra care. If you need to polish the silver, buy a polish from a tack shop and follow the directions carefully. Be sure that you don’t get the polish on the mouthpiece of the bit. Don’t use the liquid dip polish you would use on your silverware. Buff up the details on shanks with cotton swabs and a soft cloth. When you are cleaning your bit it’s a good time to look for joints that have worn thin, which can happen quite quickly with copper mouths. Look for cracks and fractures in the joints, rings, and shanks. 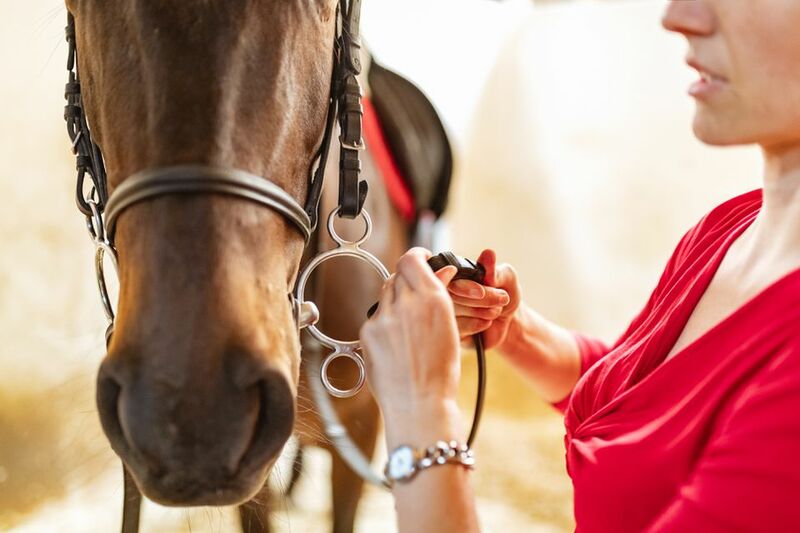 To avoid built-up grime on your bit, keep a piece of toweling in your tack box and give the bit a wipe after you’ve taken it off the horse. One of the reasons distance riders like synthetic bridles is that they can rinse both the bridle and bit after each use, and hang it away to dry.